RAYE is here to save British pop music. A former BRIT school student, she's bringing some much-needed edge to the UK charts and forcing the music industry to confront its problems in the process. Having already collaborated with the likes of Jax Jones and former Notion cover stars Stefflon Don and Mabel, she's set to continue her take over as summer 2018 approaches. 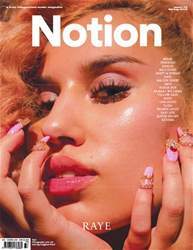 In her Notion 79 cover story she tells us about the barriers she's faced, finding her sound and her plans to flip the industry on its head.